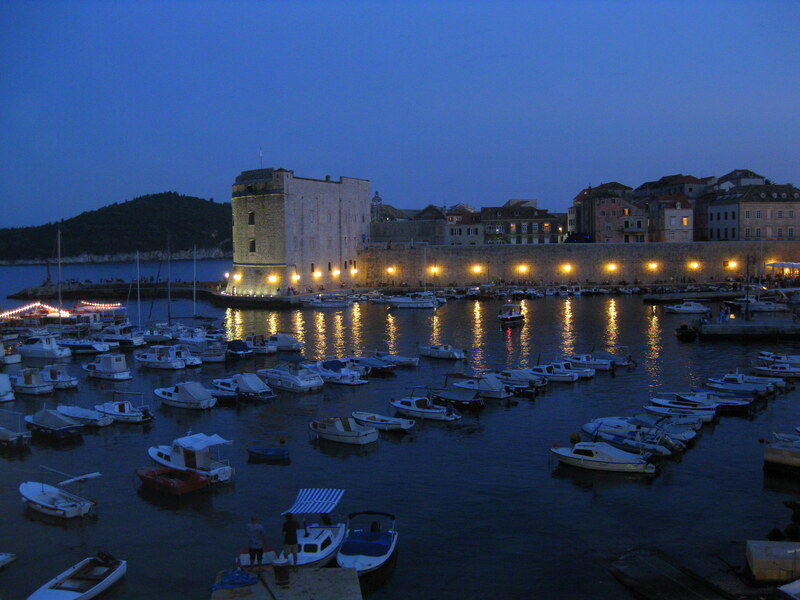 Dubrovnik, with its enviable position on the Adriatic coast, was once an important maritime port rivalling its Italian neighbours. It’s now more famous for its tourist trade, boasting one of the prettiest medieval centres in Europe and enjoying hot summer weather. A great place for a weekend break! The Croatian city – formerly under the control of Venice, later becoming independent of, but subordinate to, Hungary, and then part of communist Yugoslavia – is full of history and yet conveniently compact, with nearly all of the main attractions to be found down the Stradun, the main street, or a short walk from Luza Square. You can also easily visit the beautiful Elaphiti Islands on daily boat trips from the port. Our hotel was situated just outside the main city centre, at the far end of the Stradun by the draw-bridged Pile Gate, the main entrance to the Old Town. On our first day, after breakfast on the hotel’s sunny terrace, we paid our entrance fee and set about tackling the 2km walk around the city walls and ramparts. The walls are surprisingly intact, having been restored after the city sustained significant damage following the breakup of Yugoslavia and the seven month attack by Serb-Montenegrin forces in 1991. It’s not an easy walk, particularly in 33°C heat, and there are some quite steep sections, but the views are breathtaking. 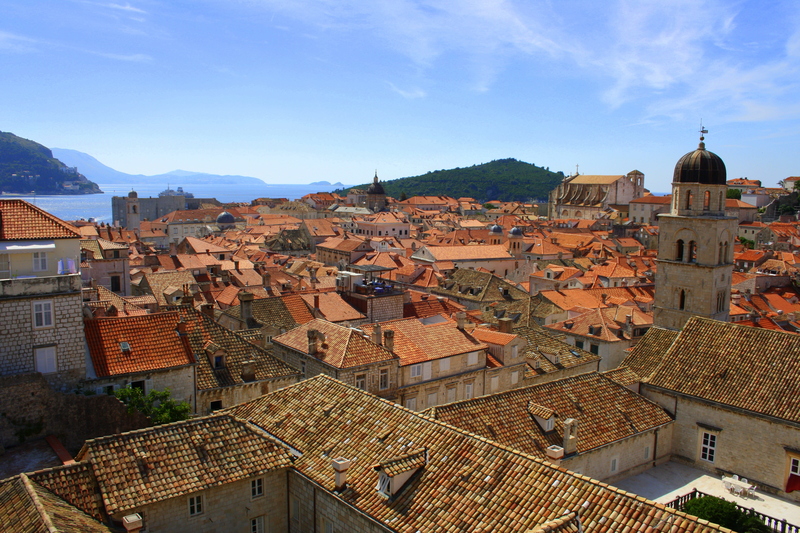 The terracotta rooftops, turrets and towers – and views across to the shimmering sea – are stunning. We spent a couple of hours just slowly ambling along the walls, stopping for the occasional drink in one of the strategically-placed cafés, pausing at Fort St. Johns on the south-eastern side of the city and Fort Minčeta at the highest north-western corner…and taking lots of photos. Having come full circle, we sat by Onofrio’s Great Fountain and treated ourselves to an ice-cream, which quickly melted and ran down our arms. Next we looked around the Franciscan church, monastery and museum, before strolling down the Stradun and checking out the little boutique shops. At the opposite end of the street, Luza Square is a great spot for lunch. We picked a cute Italian place and hid in the shade enjoying our pasta. Surrounding Luza are the main historic attractions of the city: the Dominican monastery, Sponza Palace, the Rector’s Palace and Cathedral. We saved these for the following day, and instead walked out of the Ploče Gate and around the Old Port. It’s a great setting, the walls literally dropping away into the sea and the little boats and stone jetties being ideal places from which tourists and locals can enjoy a refreshing dip. We walked through the port and out along the coast, past the pebble beach on the edge of the city, in order to look back to the postcard-perfect view of the harbour. It was only right to stop for a swim in the sea, before heading back into the old town and seating ourselves outside a bar in one of the many little squares to watch Spain defeat the Netherlands 1-0 in the 2010 World Cup final. The next morning we went up Mount Srdj on the cablecar to enjoy the panoramic vista from the summit. The view of the city is stunning and you can see all the way up the coastline to the Pelješac peninsula. The ride only takes two minutes, but the feel at the top is very different from the bustle below, with stone and scrub land reminiscent of Nevada’s rocky terrain or the Australian outback and an almost eerie solitude. We looked around deserted bunkers, took pictures from the giant stone cross and had a wander along the rim. Back in the city centre, we headed to Sponza Palace, which at various times has been a customs house, the state mint and a cultural centre, and now houses an art gallery. Tired from our exertions, we headed back for a swim in the hotel pool and a rest before dinner, then – chancing our luck – secured one of the best outdoor tables at (what I think was) a restaurant called Komarda outside the Ploče Gate. As twilight turned to night, the twinkling lights around the harbour, lapping water and sound of bat wings provided a beautiful setting for our seafood dinner. Our luck continued as we headed back into town to the sounds of a concluding open-air classical concert. The Stradun was full to bursting, torches along the street were aflame, and – as we made our way through the crowd – the clock tower lit up with cascading pyrotechnics and fireworks exploded in the sky! On our final day, we boarded a boat to the Elaphiti Islands – a collection of small islands in the Adriatic also known as the Deer Archipelago. 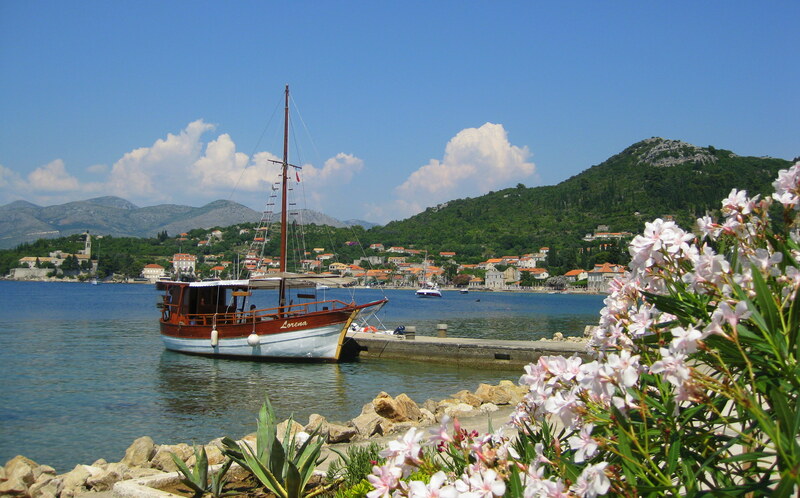 There are a small handful of tour guides along the harbour, all charging a similar price and all going to the three inhabited islands: Šipan, Koločep and Lopud. 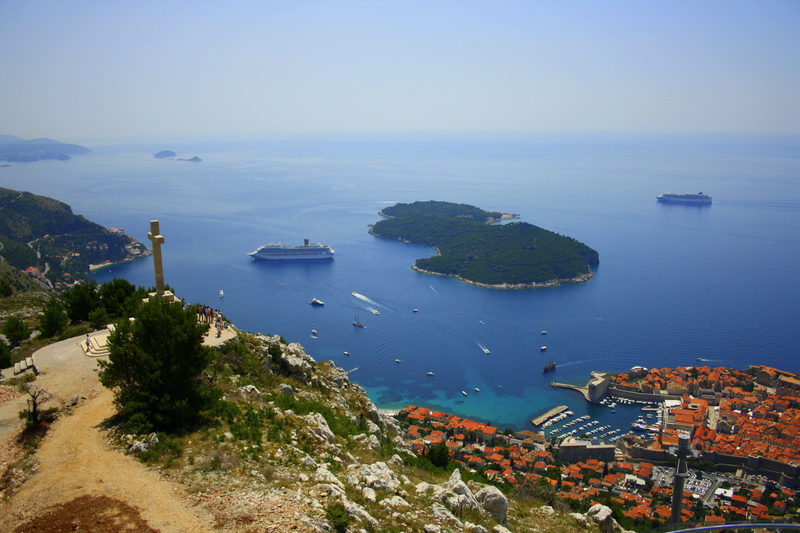 The first stop was Šipan, 17km from Dubrovnik and the largest of the islands. We strolled the harbour, alongside the olive, almond and citrus trees, and had a swim in the sea. It was a glorious blue-sky day, as it had been all of our stay. Back on the boat, we enjoyed a grilled fish lunch from an onboard barbeque. I’m usually really squeamish about eating whole fish, finding it difficult to pick around the bones, but this was so delicious I was soon sucking the bones clean. Our longest stop was at Koločep, which has two villages – Gornje Čelo and Donje Čelo – connected by a winding path that leads past small villas, gardens and olive groves, pre-Romanesque churches, and remnants of castles. We walked most of the 3km between the two, jumping aboard one of the golf-cart taxis near the end in order to leave time for a swim in the cove before we had to head onward to Lopud. 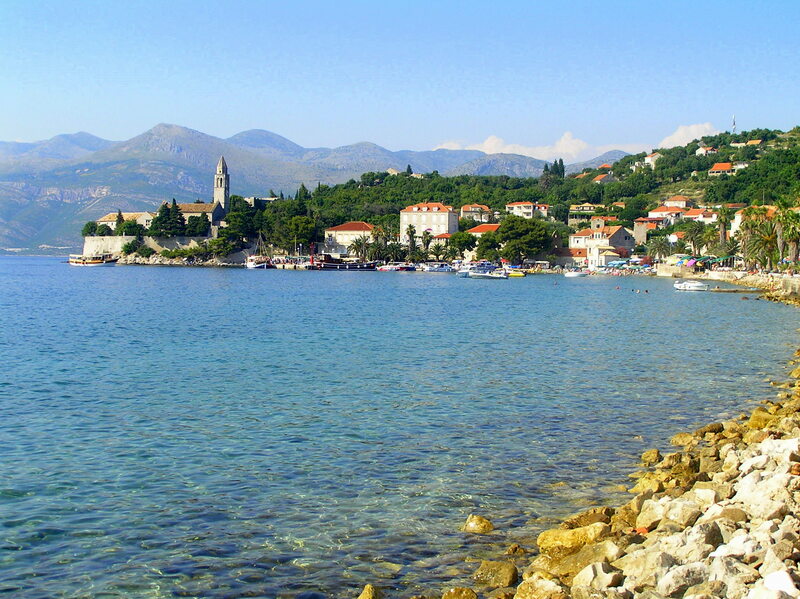 Located between the other two, we had time enough here for a stroll around the beautiful bay, an ice-cream and a paddle in the sea, looking out at the island’s Franciscan monastery and the hills of the Croatian coast beyond. I fell asleep on the boat trip back, feeling very satisfied with life. 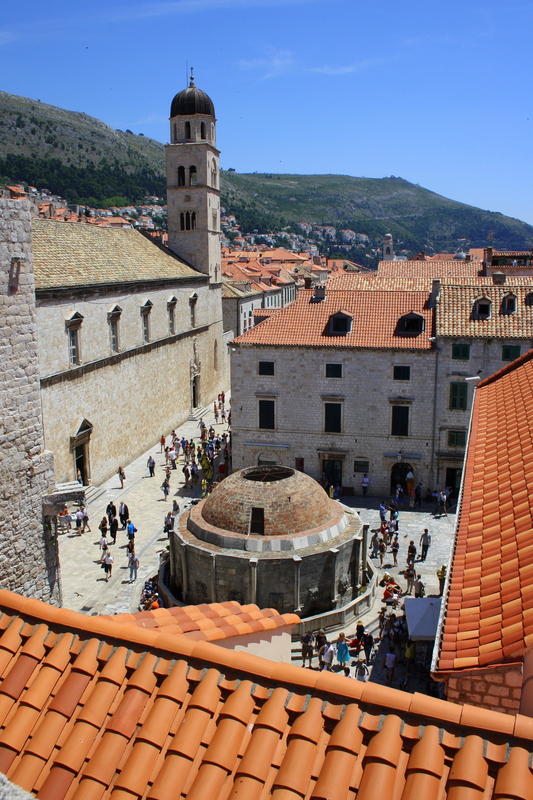 I’d recommend a mini-break in Dubrovnik to anyone. Go there now. Now! This entry was posted in Travel and tagged Croatia, Dubrovnik, Europe, Ice-cream, Koločep, Lopud, Šipan on May 25, 2013 by victoriassecretblog.